If you've never had a German radler, which resembles a British shandy -- beer + lemon soda -- don't let the summer pass without drinking one. And while you're at it, why not make the world's easiest bar snack? Seasoned potato chips. Buy chips. Invade your spice rack. Mix. (The urban equivalent of a recipe from White Trash Cooking.) Then eat a few chips and drink your radler, and you'll be happy you made both. To make the radler, combine the beer and lemon soda in a chilled pilsner glass. Squeeze the lemon wedge into the radler, then drop it in. To make the chips, put the chips in a bowl, add the spices and salt and toss with your hands to mix, until the chips are lightly coated with the spices. Head out to your patio, deck, or stoop and enjoy the early evening. I think one reason the Germans are so fond of adding flavors to their beers is because the purity laws restrict the brewers from adding any. You could never find a blueberry beer bottled in Germany. It could be a North/South thing--pilsner up here in Berlin, wheat beer down in Munich. I think the difference is that a pilsner Radler will end up a bit lighter and more refreshing, and a wheat one a bit more filling and sweet. Of course, in these parts they're served in amounts/glasses far less dainty than the one you pictured. In the north the drink is called an "Alsterwasser" and is made with a pilsner; wheat beer in the south with the Radler. (The Berliner Weisser is a very sour wheat beer btw. My summer working part-time as a "Kellnerin" in Staufen while learning German at the Goethe Institut there taught me many things during college years). Sounds very delicious! I'd also try it with my fav Xochitl tortilla chips. I didn't need to, but if you want to play it safe, heat them a little -- good idea. Yes, this combo is really just like Gatorade. Tastes better tho. Love this idea. 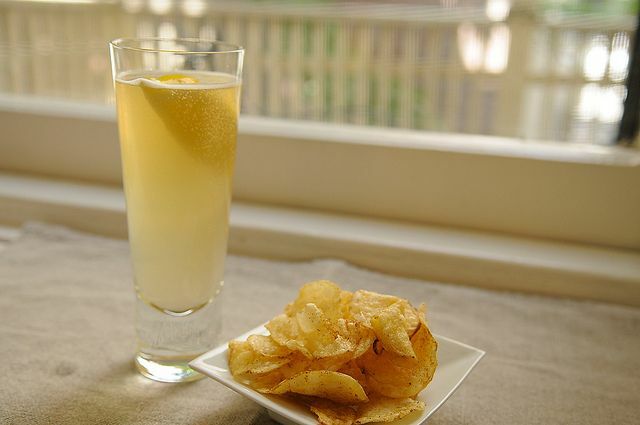 I've done the chips before and recently discovered a "lemon beer" made by Lienenkugel (which I don't presume I spelled correctly). It's called Summer Shandy. However, I think I like the idea of doing one up myself. Seems a whole lot easier than I would have thought. Thanks! Yes, and you can play around with the proportions to make them to your liking. Enjoy your Weisse, Sagegreen! Maybe to round out your Berliner repast some Currywurst should be had? Better yet: Eisbein? Now there's a new contest for Food52: pork knuckle. That's why I let Berlin 'inspire' my recipes, instead of trying to recreate theirs, other than the drinks. I do love the cuisine from both the Alemannische and Bavarian regions though. cheese1227 is right: a Radler made from lager or pilsner is *completely* different from one like this made from wheat beer. I'm in Berlin right now, and can promise that nothing bearing the name Radler has wheat beer in it. Also, it's also worth toying with proportions; here in Berlin you'll see more two-thirds pilsner to one-third Sprite. Sounds dubious, but is really unbeatable on a hot day. You could have a Berliner Weisse Mit Schuß on the Alte Liebe! I just found everything to make one with Waldmeister here in Massachusetts. I envy your location. Really? My memory of it in Munich is with wheat beer. Maybe it was lager. Anyway, I've been making them with wheat beer, but you can probably make it with any beer you like. Thanks for weighing in from Germany! Sounds totally refreshing and I am coveting the glassware! It's from Dansk, which has sadly closed. It's important to distinguish whether your are talking about a lager shandy or a bitter shandy. The first is for thirst (they go down mighty easily) and the latter is for savoring the moment in which you actually feel overheated while being in the UK! Thanks for the clarification. Was referring to lager shandy. It never entered my mind to spice up "sore bought" chips - just the easy snack with drinks I need for my al fresco dinner party tomorrow night - thanks, Amanda. Yes, it's a great cheat -- and as Merrill pointed out to me, you can also do it with popcorn. Nice! And thank you for the background notes, Sagegreen. This is a great combination. The radler was thought up during the Roaring Twenties when bicycling was becoming a popular sport in Bavaria by innkeeper Herr Kugler . Kugler had bought a huge inventory of lemon soda for this new bicyclist market, but that proved uninteresting to them. So Kugler cleverly combined the soda with beer to create the appeal and deal with his inventory. The German word for cyclist is "Radler,"
I am famous for my fennel chips...just put the chips in a bowl..put in the oven for a few minutes...grind some fennel seed in a coffee grinder and take the chips out of the oven and sprinkle the fennel over the chips and distribute evenly over the chips. Am definitely going to try these! So wierd, just last night I decided to sprinkle potato chips with lime juice and kosher salt and it was the best snack. I'm good with a PBR and a lemon, hold the soda. But I like the chip idea.